If you desire more than one day of fishing, here are some examples of fishing trips we offer, we have 17 rivers in the immediate area on which we can fish. We can travel to a different river each day from Queenstown and return each night, or we can stay out one or more nights in backcountry cabins (note: these are very basic and have no electricity or hot water). I can arrange helicopter access to more inaccessible areas. I can arrange an itinerary to suit your needs — brown and/or rainbow fishing, mountain and lowland rivers, etc. We can include backpacking fishing adventures for the more adventurous for as many days as you can handle! DAY 1: Depart Queenstown early morning for river location, return to Queenstown. This day will allow you to become familiar with our techniques and ready for our more active trout on the mountain rivers and streams. DAY 2: Early morning departure to river location. Overnight in a backcountry cabin (all food and transport included). DAY 3: Early morning departure to one of three rivers, returning to Queenstown that evening approximately 5:30pm. Note: This can be extended to fish all three of the above-mentioned rivers by 1, 2 or 3 days. DAY 1: Helicopter flight from Queenstown to one of three mountain river locations. Accommodation in backcountry cabin. Drop off down river of cabin, fish up river to cabin. 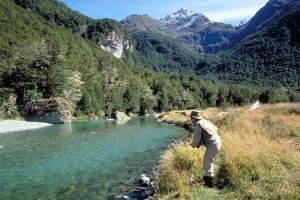 DAY 2: Early morning start fishing up river from cabin, return late afternoon by helicopter to Queenstown. PLEASE NOTE: All fishing trips are subject to change should we experience adverse weather conditions and the rivers become unfishable. 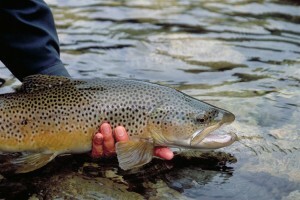 Southern Trout reserves the right to cancel or rearrange the itinerary to suit the conditions.